i-Biology.net has passed 5 million views! That’s a lot of teachers and students looking for resources, support and ideas. Please help this work make a difference beyond classrooms. Scroll down for charity donation links and personal thanks to all donors. These IB Biology presentations, Essential Biology worksheets and other resources are available to you to use for free, but please consider making a donation to one of my chosen charities via Biology4Good (powered by JustGiving.com). Hopefully they have saved you time and stress as a teacher or grades as a student – please let them make a difference to others, too. JustGiving guarantees that 100% of the donation is passed on to the charity. If you’re a UK tax-payer, the gift is boosted by GiftAid, making it even more valuable. If you donate GB£20 or more, I’ll add you to a shared folder of editable powerpoints for topics updated recently. Please let me know your email address so that I can add you. We’ve raised over GB£5,000 so far! This project started first on Gifts4Good, which has sadly closed. “Offline Donations” mentioned on each team page refer to donations that were processed in the old incarnation of Gifts4Good. Another long-time favourite of mine, with campaigns such as ‘No child born to die’. Easy to connect with as a teacher, find out more about their work on this post. Doctors Without Borders work in some of the world’s toughest medical settings, at the centre of outbreaks, conflicts and refugee camps. Although it seems a world away, their work protects the wider world and brings health where there is so often only suffering. Find out more about their work here. Trees are life – and the work of Tree Aid can bring life back to arid and deprived communities. Find out more about their work here. We’re all connected to the oceans, but they are in trouble. From fisheries to biodiversity and pollution, the Marine Conservation Society are taking action to protect our collective future. Find out more on this post. Save the Rhino do amazing work in studying and protecting rhino herds across the globe, including Indonesia. They also produce a great quarterly magazine (online and print) called The Horn. Find out more about their work here. Hope HIV do fantastic work with HIV sufferers and in HIV education and prevention. Find out more about their work here. Afrikids is a civil rights organisation dedicated to relieving child poverty in Ghana. Find out more about their work here. A popular choice with donors, Water Aid has a range of global projects focused on access to clean water and sanitation. Find out more about their work here. Off the ground – a sleeping bag for a rhino ranger! A well demined by the mines advisory group! “Now it’s been a while since I was last excited by biology (if you exclude the process of babies being born etc, which always gets me interested). But suddenly I find myself reading about cells and enzymes! It’s all because of the most recent place one of our Gifts4Good wish lists has appeared (and the first time, as far as we know, that one has been used in such a way). Biology-for-Good The wish list appears on Science Video Resources, a blog by Stephen Taylor. What lucky students to have such a great resource, and what a great guy to ask anyone who feels like showing some appreciation to make a donation to one of his chosen charities. Thanks to Hina Hashmi for her generous donations to Save the Children and Medecins San Frontiers! Thanks to Cristina Guevara for her generous donations to TreeAid and Save the Children! Thanks to Mary Lambright for her donation to Tree Aid! Thanks to Ellen Johnson for her donation to Hope HIV! Thanks to Jason de Nys for his donation to Save the Children! Thanks to David Novak and his students and colleagues for their very generous donations to the Marine Conservation Society, Mines Advisory Group, Save the Children and Save the Rhino. A great feeling! Thank-you too to Jodi Klemme for her very generous donations to AfriKids, Farm Africa, Save the Rhino and the World Land Trust! Thank-you to Djorf Amirouche for his donation to Save the Children! Thank-you to Susan Rhodes for her donations to Medecins sans Frontiers, Save the Children and Tree Aid! Thank-you to Jennifer Dionne for her generous donation to Save the Children! Thanks to Megan McClean for her donations to Tree Aid! Thank-you to Rebecca Wood for her donations to AfriKids and Medecins Sans Frontiers! Thanks to Sandy Spencer for the donation to Save the Rhino! Thanks to Elizabeth Sudlow for her donation to Save the Rhino! Thanks to Canace Panigutti for her donation to Mines Advisory Group! Thanks to Shannon Geoffrion for her donation to Save the Children! Thanks to Megan Nelson for her donation to Save the Children! Thank-you to Vera Pereira for her very generous donations to Mines Advisory Group, Hope HIV and Save the Children! Thanks to Marie Killory for her donation to Save the Children! Thanks to Chris Paine for his donations to Hope HIV, Medecins Sans Frontiers and the Marine Conservation Society! Thanks to Bil Ferzoco for his donation to Tree Aid! Thank-you to Sarah Reed for her donation to Hope HIV! Thanks to Paola Ventura for her donation to Save the Children! Thanks to Carrie Turunen for her donation to Save the Children! Thanks to Rick Gowan for his donation to Save the Rhino! It was my pleasure to make a donation but how can I access the blocked powerpoints now? Hi Carrie – I’ve shared a DropBox folder with you. Thanks to Neil Tollervey for his donation to Save the Children! Thank-you to David Fink and his students for their donation to Hope HIV! Thank-you to Jean Woodworth for her donation to Save the Children! Thank-you to Anthony Cornes for his donation to Medecins Sans Frontiers! Thanks to Cynthia Miller-Hughes for her donation to Save the Rhino! Thanks to Britta Fardig Bergstrom for her donation to Tree Aid! Thank-you to Jessica Sullivan for her donations to Hope HIV! Thank-you to Paul MacInnis for his donation to Medecins Sans Frontiers! Thank-you to Marjolein Hage-van Noort for her donations to Medecins San Frontiers, Marine Conservation Society, Save the Children and Mines Advisory Group! Thank-you to Marijana Kanisek and Glenforest Secondary School for their donation to Medecins Sans Frontiers! Thank-you to Rachel Lazar for her donation to Save the Children! Thank-you to Ann Bickel for her donations to Mines Advisory Group! Thank-you to Heather Murray for her donation to Medecins Sans Frontiers! Thank-you to Jocelyn Pendleton for her donations to Hope HIV and Tree Aid! Thank-you to Diana Angelica Carvajal for her donations to Mines Advisory Group and Save the Children. Thank-you to Stephen Smith for his donations to Save the Rhino! Thank-you to Rebecca Wood for her donations to AfriKids, Medecins Sans Frontiers, Mines Advisory Group, Save the Children, Save the Rhino and Tree Aid! Hi Rebecca – No worries, you’ll be added with this email address. Thank-you to David Novak for his donations to Hope HIV, Marine Conservation Society, Medecins Sans Frontiers, Save the Children, Mines Advisory Group and Tree Aid! 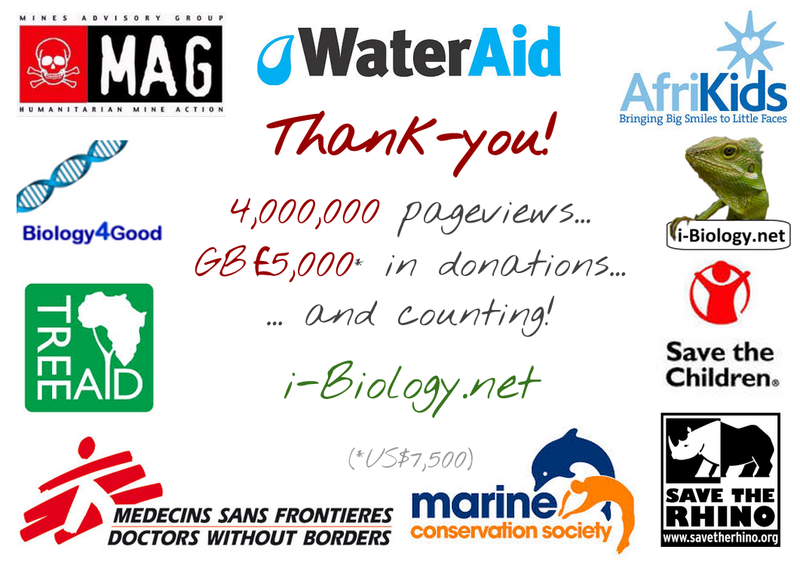 Thank-you to Kevin Smith for his donations to AfriKids, Marine Conservation Society and Medecins Sans Frontiers! Thanks again to Hina Hashmi for her donation to Save the Children! thank you for all you do. You have been a lifesaver! Thanks Andrea for your donation to Save the Rhino! Thanks to Dagmar Birkfeld for his donation to HopeHIV! Thanks to Zoe Johnson for her donation to AfriKids! Thanks to Mike Bevan for his donation to Medecins Sans Frontiers! Thank-you to June Martin for her donation to Save the Rhino! Thanks to Nikos Tasopoulos for donating to Tree Aid! Thanks to Michael Moellering for donating to AfriKids! Thank-you to Susan Rhodes for donating to Hope HIV, Medecins Sans Frontiers and Save the Rhino! Thanks Kevin Barron for donating to AfriKids! Great resources. Thank you very much for making them available. Thank-you to Britta Färdig Bergström for her donation to Tree Aid! Thank-you to Collin MacLeod for donating to the Marine Conservation Society! Thank-you to James Parsons for donating to Medecins Sans Frontieres! I very happily made the donation….greta idea, but how do i access the blocked files? Hi James – thanks for the message. You will get an invitation email now. Thank-you Tony Dura for donating to the Marine Conservation Society! Thank-you James Cottingham for donating to Hope HIV! Thank-you Christopher Watson for the donation to Water Aid! Thank-you Matt York-Smith for the donation to Water Aid! Thank-you Catherine McCosker for donating to Water Aid! Thank-you Anthony Cornes for the donation to Hope HIV! Hi Stephen, I donated via the website and was wondering if you could send me the drop-box lilnk please. My email address is matthewyorksmith@bisvietnam.com. Many thanks for your work on these resources which are benefiting my students greatly. Thanks for the donation and the message. You should get an email from DropBox very soon. Thank-you to Gayle Miller for donating to Water Aid! Thank-you to Sumair Sheikh for donating to Save the Children! Thank-you to Nikki Volmer for donating to the Marine Conservation Society! Thank-you Clare van der Willigen for donating to Tree Aid! Thank-you Isobel Lee for donating to Water Aid! Thank-you David Beale for the donation to the Marine Conservation Society! Thank-you Alison Callaghan for donating to Medecins Sans Frontiers! Thank-you Kimberly Hoffman for donating to Save the Children! Thank-you to Elspeth Jane Fraser for donating to Hope HIV! This is such an incredible resource. Thanks for sharing and for encouraging others to share as well. I recently made a donation…how do I now access the shared folder? Thanks again! Thanks for the donation! Now I have your email address, I’ve added you to a DropBox folder. Good luck! Thank-you Sarah Day for donating to the Marine Conservation Society! Hi Nadia – thanks for the donation! Now I have your email address I can add you to the folder. Thank-you Randall Driver for donating to Save the Children! Happy 30th Birthday Bro Taylor! Anya figured you didn’t need any more stuff, and so she picked Save the Rhino from the list. Thank-you Ricki Gunter for donating to Save the Rhino! Thank-you Aase Diegel for donating to Medecins Sans Frontiers! Thank-you Vivienne Weber for donating to Water Aid! Today I donated just before. Could you add my email address to your lists. Thank-you John Kish for donating to the Marine Conservation Society! Thank-you for your donation! You should have received an invitation to the DropBox folder. Thank-you Jena Kuronya for donating to AfriKids! Thank-you Cristina David for donating to the Marine Conservation Society! And thank you for your great work and being so generous with your resources. As a new IB teacher, they are invaluable to me. Thank-you Stewart Yates for donating to Water Aid! Thank-you Stephen Ryan for donating to Hope HIV! Thank-you Theresa Hemming for donating to Save the Rhino! Thank-you Margarita Alonso for donating to Water Aid! Thank you Stephen! Your work is not only very helpful but also very inspiring. Thank-you Margarita – you will have received an invitation from DropBox to the email address. Good luck! Thank-you Tony O’Sullivan for donating to Water Aid! Thank-you to Jill Galloway for donating to Medecins Sans Frontiers! Your material has been invaluable Stephen. How do I gain access to the drop box stuff now? Hi Jill – please can you let me know your email? JustGiving doesn’t automatically share it. Hi Stephen, how do I let you know about my donation? Hi Emerson – I usually receive an email from JustGiving with the donation. Please leave your email in the comment when you donate and I can add you to the folder. I made a donation already but I didn’t write it on the comment. Can I just forward you my donation receipt? Do you have an e-mail address that I can forward that to? Thanks. Hi Emerson, it’s stephen at i-biology.net. Hi Stephen, I have done my donation already without typing a comment.Can I just forward you my donation receipt? Is there an e-mail address that I can forward it to? You can e-mail me at emerson.cheng314@gmail.com Thanks! Thank-you Emerson Cheng for donating to Medecins Sans Frontiers! Thank-you to an anonymous donor for giving to AfriKids! Thank-you to Ashley for donating to the Alzheimers Society. Thank-you Kashish Khan for donating to Water Aid! Thank-you Nick Welford for donating to the Marine Conservation Society! I’ve said it before, but I’ll say it again…. your site is such a massive help for me as a teacher new to the IB world! Thanks Nick – I was wondering how to get in touch. I’ll use your email and add you to the folder. Thank-you Larry Robinson for donating to Water Aid! Thank-you Brett Stubbs for donating to Water Aid! Thank-you Gary John McDonald for donating to Medecins Sans Frontiers! Thank-you Presbyterian Ladies’ College, Western Australia, for donating to Save the Children. Thank-you Naheed Chughtai for donating to WaterAid! Thank-you to Judy Rutter for donating to the Marine Conservation Society! Thank-you Blake Sills for donating to Water Aid! Thank-you Anonymous for donating to AfriKids! Thank-you Jill Price for donating to AfriKids! (please email me and I can add you to the shared folder – stephen AT i-biology.net). Thanks Stephen – it’s taken me till now to be on holiday and remember to send you my email address! (REMOVED). You are the saviour of not only a heap of teachers, but all the folks you benefit from your Giving for good. Thanks to your great soul! Thank-you Jill, and apologies for being slow to respond during the break. Have a great new year! I’ve removed your email addresses from the message to prevent spam. Thank-you Karin Marcotullio for donating to Save the Children! Thank-you Maqbool Ahmed for donating to Save the Children! Thank-you Isabelle for donating to Medecins Sans Frontiers! Thank-you to Mrs Unger’s IB Biology Students for donating to Medecins Sans Frontiers! Thank-you to Kira Grund and her students for donating to Water Aid! Thank-you Elspeth Fraser and Cedar International School for donating to Tree Aid! Thank-you Deniz Haydar for donating to Save the Children! Thank-you to Isobel Lee for donating to Water Aid! Thank-you Helen Figueira for donating to Medecins Sans Frontiers! Thank-you Lisa James for donating to Save the Children! Thank-you to Cate McCosker for donating to Water Aid! Thank-you Diana McLaughlin for donating to Water Aid! Thank-you to Thomas Pickett for donating to Tree Aid! Thank-you Lindsay Wilgrove for donating to Save the Children! Thank-you to Alyssa for donating to Save the Rhino! Thank-you Francesca for donating to Water Aid! Thank-you to Stephen Noble for donating to Water Aid! Thank-you Marguerite Byrne for donating to Save the Children! Thank-you Hayley Doran for donating to Hope HIV! Thank-you Cristine Hellerstein for donating to Hope HIV! Thank-you Doug Abshire for donating to Water Aid! Thank-you to Jeff Fletcher for donating to Water Aid! Thank-you to Adam Abbas for donating to Medecins Sans Frontiers! Thank-you Dan Starr for donating to Water Aid! Thank-you to Ilana Saxe for donating to Water Aid! Thank-you to Ornchuma Itsathitphaisarn for donating to Save the Children! Thank-you to John Hern for donating to Save the Children! Thank-you to Ricki Gunter for donating to AfriKids! Thank-you to Cathy Tenney for donating to Water Aid! Thank-you Rhevatee Gobin for donating to Save the Children! Thank-you Gina Kelly for donating to Save the Children! Thank-you Daniel Uchacz for donating to Water Aid! Thank-you Kathy Morton for the donation to the Marine Conservation Society! Thank-you David Robbins for donating to Save the Children! Thank-you to Christina Weaver for donating to the Marine Conservation Society! Thank-you to Chuck Lunney for donating to Medecins Sans Frontiers! Thank-you Karen Portman for donating to Save the Children! Thank-you Richard Gross for donating to Save the Children! Please could you let me know how to access the drop box? Thank you again for your blog and website resources. They have been a tremendous help in understanding how to implement the IB objectives, concepts and language. Hi Richard – I used the email address from your Just Giving donation to send an invitation to DropBox. Please let me know if it does not work. Got it Stephen, thank you! Thank-you to Krista Restivo for donating to Save the Children and Medecins sans Frontiers! Hi Krista – all the editable files I still have are in there. Much older files were made on different software with bad screenshots, so they couldn’t be edited once I moved to a Mac school and away from SMART boards. I don’t have the originals any more, sorry. Thanks so much for getting back to me! I’m sorry you’ve felt the pain of losing hard work due to a switch in formatting! Thank-you Dianne Maxwell for donating to Save the Children! Thank-you Christopher Wilkinson for donating to Water Aid! Thank-you Leslie for donating to the Mines Advisory Group! Thank-you to Nova for donating to the Marine Conservation Society! Thank-you Mary Holden for donating to AfriKids! Thanks to Caleb Bridle for donating to Water Aid! Thank-you Cathleen for donating to Medecins Sans Frontiers! Thank-you Tavis Davidson for donating to HopeHIV! Thank-you Adriana for donating to Medecins Sans Frontiers! Thank-you Sandra Silvestre for donating to Save The Children! Thank-you to David Mayer for donating to Medecins Sans Frontiers! Thank-you JuLain Mooney for donating to AfriKids! Thank-you Steve Leach for donating to Medecins Sans Frontiers! Thank-you to Sara Grant for donating to Medecins Sans Frontiers! Thank-you to Tara Brewitt for donating to Tree Aid! Steven, I donated to the marine Conservation group. JP above. Any chance you could please add me to your editable folder collection? thanks. Hi JP – no worries. The auto-inform didn’t go through, but I found your email. Thank-you for the donation! I am really so happy to know your website and would like to thank you so much for all your sharing! I made a donation for Tree Aid. Would it be possible to put me on the list so that I can use your slides? Thank-you Jonny Tate for donating to Water Aid! Thank-you Anouck Haverbeke for donating to Tree Aid! Hi Amy – thank-you, and done! Thank-you Amy Liversidge for donating to Medecins Sans Frontiers! Hi Stephen. I recently donated to Save the Rhino. Could you add me to the shared folder? Thanks so much! Thank-you for the donation, Zak – and done! Thank-you Ken Reiman (St Catherines, Greece) for donating to Save the Children! Thank-you Cristina Goucher for donating to Water Aid! Thank-you Avril for your generous donations to Save the Children and Medecins Sans Frontiers! Thank-you Cheryl Haus for donating to AfriKids! Thank-you Erin Stamper for donating to Water Aid! Thank-you to Karing Hartog for donating to Mines Advisory Group. We’ve now passed £5,000 in total donations! Thank-you Catherine Symes for donating to Water Aid! Thank-you Viv Owens for donating to Mines Advisory Group! Thank-you Elly Holland for donating to MSF! Thank-you Sarah Hays for donating to MSF! Thanks to Alan Richards for donating to Water Aid! Thank-you to Mahesh Alur for donating to Medecins Sans Frontiers! Thanks to Natasha for donating to the Marine Conservation Society! Thank-you Luke Templar for donating to Water Aid! Thank-you to Michael Lathery for donating to HOPE HIV! Thank you for all your great resources. It has been a massive help. Are the charity links still active can i make a donation and will you please add me to your folder please? Thanks to Adam Bradford for donating to the Marine Conservation Society! Thanks to Kathleen Franzen for donating to HopeHIV! Thanks to an anonymous donor for donating to the Mines Advisory Group! Thank-you to Elena Camino for donating to Water Aid! Thanks to Theresa Oleniczak for donating to Water Aid! Thank-you to Julie Knight for donating to Water Aid! Thank-you Yasemin for donating to Save the Children! Thank-you to Zakaria for donating to AfriKids! Thanks for all the hardwork and a great idea, I’ve just returned to the classroom after a few years of non-profit work and wanted to jump start the schools programs. I made the $30 donation and would love access to the google drive folder. Thanks for all the hard work and a great resource, I’d love access to the folder for my return to the classroom after 4 years in nonprofit ed! Thank-you to Kate Blasioli for donating to Save the Children! Thank-you David Allen for donating to Water Aid! Hi Stephen. Thanks for the hard work and for the noble causes. I’ve made a donation and I would like the shared folder also, please. Thank-you for your donation, Khalil! Thanks to Jason Benton of SIS ESF Hong Kong for choosing WaterAid for a charitable donation. It is much appreciated! Thank-you Karin Ringblom for donating to Tree Aid! It is very much appreciated.